The Extendable multi user microprocessor ELAN system (EUMEL) is a microkernel operating system. Gesellschaft für Mathematik und Datenverarbeitung (GMD) and Hochschulrechenzentrum (HRZ) of Bielefeld University created and developed it between 1978 and 1990. L3, EUMEL’s successor, is still in use by a few legacy systems as of 2016. The OS has two hardware abstraction layers, significantly improving its portability. The first one, Software/Hardware (SHard), provides functions for a concrete machine, such as the Olivetti M20, Amiga ST or IBM PC AT/XT. EUMEL0 (Urlader), the second layer, implements a virtual machine on top of a specific processor architecture like Z80 or x86. Programs are compiled into bytecode for the virtual EUMEL0 machine, making them portable across different machines. Every object (dataspace) lives in a single, virtual address space. A dataspace is divided into pages, which can reside in memory or on disk. The operating system transparently moves (swaps) pages to disk if they have not been in use lately and reads them back as soon as a process needs the data. Every file and every task is a dataspace. Pages are shareable and can be copied without a cost. EUMEL automatically unshares them if changes are made to one of the copies. Since everything resides in the single-level store the machine can powered off and back on again, with all tasks restarting execution from the last snapshot. These are created on request and every 15 minutes. A single machine running EUMEL is capable of serving multiple “thin clients” connected via serial lines. Additionally users can share files and start remote processes by linking multiple machines with EUMEL-Netz. ELAN is system implementation language, programming language, shell language and documentation language. Fortunately a set of 1.2 MB install floppy disks of EUMEL’s x86 port has been preserved, see section artifacts. It can be installed in any virtual machine emulating an IBM PC. In this example we’re using qemu. Create a new partition by pressing 1<return>, confirm with j and accept the following defaults with <return> or j. If the main screen is displayed again press 0<return> and confirm yet again with j to exit setup. The screen should now read “E N D E”. Quit qemu and restart it with the third floppy disk. The bootloader complains that “HG ungueltig”. Press any key followed by 2 and a confirmation with j. Reset the machine again. Now we have to set up the keyboard layout and time. Select “Kanal 1” with j, then press n until pc.1.25 is displayed and confirm. Disable “Kanal 2” and 15 with n and decline deleting those channels with n.
Congratulations, a fully functional EUMEL is now running in your virtual machine! For the next steps head over to [praxis1]. In 1974 the research group Programmiersprachen und Compiler II at TU Berlin led by C.H.A Koster and Hochschulrechenzentrum (HRZ) Bielefeld developed different versions of SLAN, a programming language family suited for educational purposes. This language was later renamed to ELAN, an abbreviation for Elementary Language [hahn79] [klingen83] or Educational Language [hommel79]. Jochen Liedtke and Ulrich Bartling, both studying maths at Bielefeld University at that time, created a compiler for SLAN3B as part of their diploma thesis in 1976 [liedtke76][bartling76]. It was written in CDL, a machine independent compiler description language, and generated code for Siemens’ BS 1000 and BS 2000 mainframe operating system running on a BS 4004/45 machine. It was later ported to the IBM 370 and TR 440 [hahn79]. But ELAN was supposed to be used in schools or at universities and most of them could not affort the cost of such a machine. Thus a compiler and runtime system for the smaller and less expensive microprocessors was needed [liedtke79]. Development of this system began in 1977 or 19781. It ran on the Zilog Z80 microprocessor with 64 kilobytes of RAM. This machine’s cost were approximately 20,000 DM (10,000 USD). The runtime system was called Extendable multi user microprocessor ELAN system, abbreviated EUMEL. A year later, in 1979, details about EUMEL were published in GMD Spiegel [liedtke79], a quarterly publication published by GMD, and then presented at 9. Jahrestagung der Gesellschaft für Informatik at University of Bonn [kloeckner79]. Officially the cooperation between HRZ Bielefeld and GMD began in fall 1979 [gmdspiegel85d]. The original ELAN compiler written by Liedtke and Bartling was rewritten in 1982 as part of project MIKROS at GMD [eumelspiegel82d]. Its replacement was programmed using CDL’s successor, CDL2 [cdl2-basismaschine82] [gmdbericht84]. This work resulted in ports of EUMEL to different processor architectures, starting with Zilog 8001 used by the Olivetti M 20. This version was presented a year later at Hannover Messe 1983 [computerwoche83a] [rechenanlagen83]. Another two years later, in October 1987, the spin-off company ERGOS (Ergonomic Office Software GmbH) finally started marketing EUMEL to customers. GMD was still responsible for development and maintenance of EUMEL and schulis until 1990 [gmdspiegel87c]. The following table lists release dates. It was reconstructed from multiple sources. Yearly workshop were held at different locations, first at Bielefeld University and later at GMD Birlinghofen. EUMEL was also used by HRZ Bielefeld and at GMD Bonn, as well as TU Berlin [hahn79] and TU Darmstadt. Additionally 400 lawyers ran advodat on EUMEL in 1987 [cr87a]. A survey amongst those located in Hannover in 1994 revealed four of 56 (7%) law offices still ran EUMEL machines eight years after intruduction of ErgoJUR and advodat [jurpc94]. By mid 1985 support for the Japanese Kanji writing system was added to EUMEL [gmdspiegel85d]. A newly founded corporation NISSIN Products Corp. Tokyo sold the product on the Japanese market [gmdbericht85]. There are several tools for dealing with EUMEL data structures. extractArchive.py reads archive disks, which are similar to tarballs, and extracts their contents. The packet basic archive has more information on that [source86]. Documentation for the dataspace FILE can be found in the packet file handling. convertFileDs.py converts this dataspace into a plain text file. Run EUMEL0 interpreter. This program is able to load dataspaces from floppy disks, which is required in the next step. Load code and variable dataspaces for both passes of the cross-compiled ELAN compiler. Load base system’s source code from floppy disks. This includes the supervisor, monitor, editor and all functions described by the ELAN standard. Compile and run the supervisor. Save all dataspaces to disk. The EUMEL0 machine is a process virtual machine just like Pascal’s p-code machine or the Java Virtual Machine (JVM). It isolates tasks from each other and the system. Running native code is not possible. EUMEL0 is a multi address machine with no general purpose registers and thus data lives in virtual memory only. A few internal registers like instruction counter, condition flag for branching, several segment and status registers and a stack pointer exist. The CISC instruction set was specifically designed for the high-level language ELAN. It includes arithmetic operations for ELAN’s primitive datatypes such as signed and unsigned integer as well as float (REAL) and operations for bytestrings (TEXT) and dataspaces. However the machine itself does not tag data and therefore doesn’t enforce types at runtime. The usual control flow operations are accompanied by ELAN-specific call and return instructions. Special instructions for terminal and archive disk I/O, exception-like error handling and inter-process communication (IPC) are available. Some of the 31 primary instructions can be encoded with just two bytes. They consist of a 6 bit opcode and one short operand. Whenever the latter uses more than 10 bit a long encoding consisting of two bytes opcode plus operands is used. This format also encodes 127 secondary and six special instructions. Details can be found in chapter two of [kernel83], the ELAN package eumel coder, this debugger’s sources and documentation and a reimplementation of the EUMEL0 virtual machine, EUMuLator. This section contains downloadable floppy disk images rescued mostly from 5″ floppy disks (1.2 MB), grouped by category. Additionally ELAN and assembly source code of applications and EUMEL’s kernel can be found in this repository and here. EUMEL 1.8.6 (Urlader 1523) for IBM PC AT/XT dated January/February 1991. Includes setup instructions, setup, std.zusatz, std.graphik, printer drivers, manuals and DOS extensions and EUMEL Netz. Dated February/March 1991. BASIC and DYNAMO compiler, LISP and Prolog interpreter, gs.hamster, gs.process, gs.dialog, gs.menugenerator, gs.mp-bap, gs.warenhaus and EUDAS 4.3 including documentation. Three 360k floppy disk images for IBM PC containing Urlader (V 1.0 R, 1985), single-user and multi-user Hintergrund. EUMEL 1.7.3 installer and user manual. Public Domain version 2.7. SHard 5.2g, EUMEL 1.8.7 (Urlader 1523) for IBM PC on 1.2M disks, dated 1990 and several printer packets from 1988 and 1989 on 360k floppies. Install media for L3 v2.1 and v2.2, as well as drivers and utils. „Free“ distribution of L3, including install media, system disks, GNU C compiler and SQLE database software. See [l3frei94] for install instructions and license. Version 3.4, 4.4 and 5.3 on 720k floppies, as well as FLINT 0.4 and documentation for version 4. Improved graphics subsystem, version 2.2 from November 1987.
schulis math package, version 1.0. For documentation see [schulis-mathe-handbuch] and [schulis-mathe-begleitheft]. schulis simulation package for biology, chemistry and physics. Version 3.0. For documentation see [simsel-handbuch]. Floppy disk images listed in this section contain parts of an EUMEL system and development tools. ModSoft setup and SHard 2.8, Schönbeck setup EUMEL version 3.1 (SHard 4.9g) including source code, 3.2 (SHard 5.1g), 3.2 (SHard 5.2g) and SHard 4.7g. Miscellaneous Urlader, version 1.8.1t with info, 1.8.2e and 10057. Hintergrund containing EUMEL 1.8.1, 1.8.2, 1.8.4 and 1.8.7. Miscellaneous debugging tools: Tracing version 1, dataspace copy, disk monitor 3.5 and 3.7 and EUMEL coder 1.8.1. See [debug-1] and [load-ds4]. SHard porting documentation for M68k, x86 and Z80 processor architectures. See [portintel85], [portintel86] and [portz8084] for printed versions. Source code for builtin packages of version 1.7.5. The German word Eumel describes a likeable fool (wally). Wikipedia refers to EUMEL as L2 (for Liedtke 2). However this name is not mentioned in any documentation or source code. It was added to the German and English Wikipedia in 2006 without a source, which could be Jochen Liedtke’s death notice. If you want to contribute floppies, manuals or documentation contact me in English or German via email or file an issue on GitHub. I’d like to thank the following people for supporting this work: Gerd Aschemann, Ulrich Bartling, Frank Bellosa, Uwe Beyer, Hilmar von dem Bussche, Adolf Breiling, Detlef Dewitz, Martin Flasskamp, Denis Giffeler, Rainer Hahn, Dietmar Heinrichs, Peter Heyderhoff, Robert Keil, Frank Klapper, Konrad Klöckner, Peter Kraege, Adelheid Liedtke, Albert Noltemeier, Lothar Oppor, Ulrike Petersen, Lutz Prechelt, Axel Puhlmann, Rudolf Ruland, Bhabani P. Sinha, Michael Staubermann, Bruno Westphal, Karl Wilhelm Starke, Stefan Stein, Michael Thies. Sources: [computerwoche83a], [gmdbericht84], [gmdspiegel85d], [seyfert87], [stc87a], [vertriebsinfos], [eumelaktuell85]. The following (commercial) software, grouped by vendor, was available for EUMEL. Prices excluding VAT/GST. Sources: [praxis3] pp. 223–224, [rechenanlagen83], [computerwoche87a], [ambros90b], [software93] p. 294 and p. 376, [vertriebsinfos], [seyfert87]. Michael Spehr: EUMEL – das andere Betriebssystem. 68oooer, issue 1, pp. 52–54. 1988-01. 6xq.net. ALWR Kommissionsbericht: Mikrocomputer: Einsatz im Hochschulbereich. 1982-10-22. zki.de. Wolfgang Ambros: Der Hamster – Programmieren lernen in einer Modellwelt. 1987. 6xq.net. Wolfgang Ambros: Der Hamster – Programmieren lernen in einer Modellwelt – Lehrerband. 1987. 6xq.net. Wolfgang Ambros: ITG mit EUMEL und ELAN. LOG IN, issue 10, pp. 55–58. 1990. 6xq.net. Wolfgang Ambros: Das Betriebssystem EUMEL. LOG IN, issue 10, pp. 86–88. 1990. 6xq.net. Wolfgang Ambros: Zur Akzeptanz der EUMEL-Software. LOG IN, issue 5. 1990. Betriebssystem EUMEL auf Personal Computern. Automatisierungstechnik at, volume 34, issue 5, p. 174. 1986. degruyter.com. Ulrich Bartling: Implementation eines SLAN-Compilers, Teil 2. 1976. 6xq.net. Dietmar Heinrichs, Jochen Liedtke, Rainer Hahn and Peter Heyderhoff: Einführung in das EUMEL-System. EUMEL-Benutzerhandbuch Version 1.6, volume 1. 6xq.net. Dietmar Heinrichs, Jochen Liedtke, Rainer Hahn and Peter Heyderhoff: Der Supervisor und das Task-System, Der EUMEL-Monitor. EUMEL-Benutzerhandbuch Version 1.6, volume 2/3. 6xq.net. Dietmar Heinrichs, Jochen Liedtke, Rainer Hahn and Peter Heyderhoff: Der EUMEL-Editor. EUMEL-Benutzerhandbuch Version 1.6, volume 4. 6xq.net. Dietmar Heinrichs, Jochen Liedtke, Rainer Hahn and Peter Heyderhoff: Der ELAN-Compiler im EUMEL-System. EUMEL-Benutzerhandbuch Version 1.6, volume 5. 6xq.net. Dietmar Heinrichs, Jochen Liedtke, Rainer Hahn and Peter Heyderhoff: Allgemeine Dateiverwaltung. EUMEL-Benutzerhandbuch Version 1.6, volume 6. 6xq.net. Dietmar Heinrichs, Jochen Liedtke, Rainer Hahn and Peter Heyderhoff: Der Datentyp FILE und seine Operationen. EUMEL-Benutzerhandbuch Version 1.6, volume 7. 6xq.net. Dietmar Heinrichs, Jochen Liedtke, Rainer Hahn and Peter Heyderhoff: Archivverwaltung. EUMEL-Benutzerhandbuch Version 1.6, volume 8. 6xq.net. Dietmar Heinrichs, Jochen Liedtke, Rainer Hahn and Peter Heyderhoff: Textbe- und -verarbeitung. EUMEL-Benutzerhandbuch Version 1.6, volume 9. 6xq.net. Dietmar Heinrichs, Jochen Liedtke, Rainer Hahn and Peter Heyderhoff: Text-Strukturierungssystem EUDAS. EUMEL-Benutzerhandbuch Version 1.6, volume 10. Dietmar Heinrichs, Jochen Liedtke, Rainer Hahn and Peter Heyderhoff: Drucker im EUMEL-System. EUMEL-Benutzerhandbuch Version 1.6, volume 11. 6xq.net. Dietmar Heinrichs, Jochen Liedtke, Rainer Hahn and Peter Heyderhoff: Der SPOOLER. EUMEL-Benutzerhandbuch Version 1.6, volume 12. 6xq.net. Dietmar Heinrichs, Jochen Liedtke, Rainer Hahn and Peter Heyderhoff: Fehlerbehandlung im EUMEL-System. EUMEL-Benutzerhandbuch Version 1.6, volume 13. 6xq.net. Dietmar Heinrichs, Jochen Liedtke, Rainer Hahn and Peter Heyderhoff: Standardpakete im EUMEL-System. EUMEL-Benutzerhandbuch Version 1.6, volume 14. 6xq.net. Dietmar Heinrichs, Jochen Liedtke, Rainer Hahn and Peter Heyderhoff: Weitere Standard-Datentypen. EUMEL-Benutzerhandbuch Version 1.6, volume 15. 6xq.net. Dietmar Heinrichs, Jochen Liedtke, Rainer Hahn and Peter Heyderhoff: Spezielle Datentypen. EUMEL-Benutzerhandbuch Version 1.6, volume 16. 6xq.net. Dietmar Heinrichs, Jochen Liedtke, Rainer Hahn and Peter Heyderhoff: Graphik im EUMEL-System. EUMEL-Benutzerhandbuch Version 1.6, volume 17. Dietmar Heinrichs, Jochen Liedtke, Rainer Hahn and Peter Heyderhoff: Der Graphik-Editor. EUMEL-Benutzerhandbuch Version 1.6, volume 18. Dietmar Heinrichs, Jochen Liedtke, Rainer Hahn and Peter Heyderhoff: Der Scanner. EUMEL-Benutzerhandbuch Version 1.6, volume 19. Dietmar Heinrichs, Jochen Liedtke, Rainer Hahn and Peter Heyderhoff: Der OPERATOR. EUMEL-Benutzerhandbuch Version 1.6, volume 20. Dietmar Heinrichs, Jochen Liedtke, Rainer Hahn and Peter Heyderhoff: Job-Accounting. EUMEL-Benutzerhandbuch Version 1.6, volume 21. Rainer Hahn: Vorläufiges EUMEL-Benutzerhandbuch (Null-Version). 1979-11-07. Lowell A. Carmony: ELAN: An Elementary Language That Promotes Godd Programming. Proceedings of the Thirteenth SIGCSE Technical Symposium on Computer Science Education, pp. 163–166. 1982. 6xq.net. Jochen Liedtke: CDL2 Basismaschine. 1982-06-29. 6xq.net. Große Zukunft für wenige. Chip, issue 7, pp. 92–95. 1984-07. Siegfried Kröger: Gemeinsamkeit macht stark. Chip, issue 3, pp. 276–277. 1987-03. 6xq.net. Drei Betriebssysteme für den Atari ST. Chip, issue 12, pp. 126–128. 1987-12. 6xq.net. J. Höfling: Mikro-Vernetzung über Eumel-Netz. Chip, Chip Plus, issue 6, pp. 4–6. 1988-06. 6xq.net. C. Dürr: Zehn Betriebssysteme. Chip, issue 8, pp. 120–128. 1989-08. 6xq.net. „Eumel“ mit „Elan“. Computerwoche, issue 25. 1979-06-22. computerwoche.de. Vier Tage Härtetest für „Eumel“. Computerwoche, issue 43. 1979-10-26. computerwoche.de. 16-Bit-Version auf Ollivetti-M20. Computerwoche, issue 17. 1983-04-22. computerwoche.de. Ausbildungs-Eumel. Computerwoche, issue 43. 1983-10-21. computerwoche.de. DV-Transparenz für Anwälte angepeilt. Computerwoche, issue 45. 1985-11-08. computerwoche.de. Japaner zeigen Interesse an „Eumel“. Computerwoche, issue 11. 1986-03-14. computerwoche.de. Technologiepreis für Eumel verliehen. Computerwoche, issue 4. 1986-01-24. computerwoche.de. 32-Bit-„Maximikro“ von Proteus. Computerwoche, issue 11. 1986-03-14. 6xq.net. Softwareprodukte laufen unter Eumel. Computerwoche, issue 11. 1987-03-13. 6xq.net. GMD zeigt Eumel-System in Theorie und Praxis. Computerwoche. 1987-08-28. computerwoche.de. Eumel und Schulis auf dem Prüfstand. Computerwoche, issue 16. 1988-04-15. computerwoche.de. Lizenzfreie Programme für Schulen und Universitäten. Computerwoche, issue 25. 1991-06-21. computerwoche.de. Joachim Durchholz: Unix und seine Konkurrenten. computer persönlich, issue 23, pp. 88–96. 1986-10-29. 6xq.net. Nixdorf mit neuem Anwalts-PC. Computer und Recht, issue 9, p. 613. 1986. juris.de. Olivetti und Kienzle übernehmen Advodat-Paket. Computer und Recht, issue 3, p. 206. 1987. juris.de. Jetzt DFÜ-Software für Advodat-Nutzer. Computer und Recht, issue 5, p. 332. 1987. juris.de. Dieter Craemer: DYNAMO auf dem EUMEL-System. Arbeitspapiere der GMD, issue 17. 1983. Dieter Craemer: BOXDYN - eine komfortable Benutzeroberfläche für das DYNAMO-System im Betriebssystem EUMEL. Simulationstechnik: 4. Symposium Simulationstechnik Zürich, 9.-11. September 1987 Proceeding, pp. 214–221. 1987. 6xq.net. Klaus Rindtorff: Mit Elan dabei. c’t, issue 8, pp. 54–55. 1987. 6xq.net. Rainer Danckwerts, Roland Stowasser, Klaus Bovermann, Walter Deuber and Dankwart Vogel: Elementare Methoden der Kombinatorik. 1985. 6xq.net. Jürgen Bendisch: DASYS-Handbuch. Anwendersoftwareklasse 2. 1986-08-08. bitsavers.informatik.uni-stuttgart.de. Gyula Szalay: EUMEL DEBUG Version 1. 6xq.net. Robert Keil and Dieter Craemer: DYNAMO-Compiler. Anwendersoftwareklasse 2. 1984-02. 6xq.net. Robert Keil and Dieter Craemer: DYNAMO-Compiler. Anwendersoftwareklasse 2. 1986-08-08. bitsavers.informatik.uni-stuttgart.de. Jochen Liedtke: Einladung zum EUMEL-Workshop. 1984-05-19. 6xq.net. ELAN Newsletter, issue 11. 1981-01-06. 6xq.net. ELAN Newsletter, issue 12. 1981-11-13. 6xq.net. Werner Ende: LABORIS – zukunftsweisende Software für Ärzte. Deutsches Ärzteblatt, issue 24, pp. A-1774–A-1775. 1987-06-11. aerzteblatt.de. Uwe Beyer: EUMEL Entwurfsprinzipien. 6xq.net. Thomas Berlage: EUDAS Anwender-Datenverwaltungssystem Version 3: Benutzerhandbuch. 1985-09. 6xq.net. Thomas Berlage: EUDAS Anwender-Datenverwaltungssystem Version 4: Referenzhandbuch. 1986-09. 6xq.net. EUMEL-aktuell, issue 1. 1985-09-21. 6xq.net. Informationen über EUMEL. EUMEL: Das Betriebssystem für Mikrocomputer. Produktinformation. Für Anwender und Hersteller. 1984. 6xq.net. Reinhard Nolting, Dietmar Heinrichs and Jochen Liedtke: EUMEL spiegel, issue 1/81. 1981. 6xq.net. Jochen Liedtke: EUMEL spiegel, issue 2/81. 1981. 6xq.net. Heiko Indenbirken, Harald Drewes, Hans Bussmann, Jochen Liedtke and Konrad Klöckner: EUMEL spiegel, issue 1/82. 1982. 6xq.net. EUMEL spiegel, issue 2/82. 1982. 6xq.net. Jochen Liedtke: EUMEL spiegel, issue 4/82. 1982. 6xq.net. Peter Heyderhoff, Detlef Dewitz, Konrad Klöckner, Rainer Hahn and Dietmar Heinrichs: EUMEL spiegel, issue 3/82. 1982. 6xq.net. Technologie-Preise für GMD-‚Eumel‘. Bonner General-Anzeiger, Stadtausgabe Bonn, p. 7. 1985-12-10. 6xq.net. Deutsches Computersystem für die japanische Schrift. Bonner General-Anzeiger, Stadtausgabe Bonn, p. 27. 1986-03-06. 6xq.net. EUMEL: Das Mehrplatz-Betriebssystem. EUMEL: Das Betriebssystem für Mikrocomputer. Produktinformation. Für Anwender und Hersteller. 1985-11. 6xq.net. Offizielle Einführung eines Schulverwaltungsrechners im Rhein-Sieg-Gymnasium in Sankt Augustin. GMD Jahresbericht, pp. 159–160. 1982. 6xq.net. Barbara Schmidt-Belz and Adolf Breiling: SCHULIS – ein Informationssystem zur Unterstützung der Verwaltungsaufgaben in Schulen. GMD Jahresbericht, pp. 32–41. 1983. 6xq.net. Konrad Klöckner: EUMEL – ein zukunftsweisendes Betriebssystem für die Softwareentwicklung. GMD Jahresbericht, pp. 98–109. 1984. 6xq.net. GMD Jahresbericht, pp. 175–176. 1985. 6xq.net. GMD Jahresbericht, pp. 193–194. 1986. 6xq.net. EUMEL-Workshop ’86: Neue Perspektiven für das Mikrocomputer-Betriebssystem der GMD. GMD Jahresbericht, p. 222. 1986. 6xq.net. SCHULIS – Konzeption und Realisierung eines schulinternen Informationssystems mit Hilfe einer partizipativen Vorgehensweise. GMD-Spiegel, issue 1, pp. 46–68. 1982. 6xq.net. Informationssystem SCHULIS wird dem Schulausschuß der Stadt Sankt Augustin vorgestellt. GMD-Spiegel, issue 2, p. 28. 1983. 6xq.net. Computer in Unterricht und Verwaltung – Informationssystem SCHULIS im Rhein-Sieg-Gymnasium Sankt Augustin. GMD-Spiegel, issue 1, p. 41. 1984. 6xq.net. Informatikunterricht in der Schule mit ELAN und EUMEL – Bundespräsident Carstens besucht Bonner Helmholtz-Gymnasium. GMD-Spiegel, issue 2, p. 49. 1984. 6xq.net. Konrad Klöckner: Betriebssystem EUMEL: Softwareentwicklung auf Mikrocomputern. GMD-Spiegel, issue 1, pp. 32–39. 1985. 6xq.net. Adolf Breiling and Barbara Schmidt-Belz: schulis – ein Softwaresystem für Schulen. GMD-Spiegel, issue 1, pp. 40–48. 1985. 6xq.net. Karl Wilhelm Starcke: EUMEL erobert neue Anwendergruppen. GMD-Spiegel, issue 3/4, pp. 42–43. 1985. 6xq.net. Technologie-Transfer-Preis 1985 für Mikrocomputer-Betriebssystem EUMEL. GMD-Spiegel, issue 3/4, pp. 6–8. 1985. 6xq.net. Forschung für Schüler und Schule: schulis – das Softwaresystem aus einem Guß. GMD-Spiegel, issue 2/3, pp. 6–8. 1987. 6xq.net. EUMEL-Workshop 1987: Neue Perspektiven für das Mikrocomputer-Betriebssystem der GMD. GMD-Spiegel, issue 4, pp. 54–55. 1987. 6xq.net. ERGOS – ein junges Unternehmen vermarktet das Mikrocomputer-Betriebssystem EUMEL. GMD-Spiegel, issue 4, pp. 71–72. 1987. 6xq.net. Werner Metterhausen and Ulrike Petersen: L3 – ein neues Betriebssystem der GMD für die neunziger Jahre. GMD-Spiegel, issue 1, pp. 29–32. 1988. 6xq.net. Integrierte Software für Schulverwaltung und Unterricht. GMD-Spiegel, issue 1, p. 63. 1988. 6xq.net. L3 hautnah. GMD-Spiegel, issue 4, pp. 61–62. 1988. 6xq.net. Karl Wilhelm Starcke: schulis, EUMEL und L3 auf dem Weg in die praktische Anwendung. GMD-Spiegel, issue 4, pp. 62–63. 1988. 6xq.net. Karl Wilhelm Starcke: schulis auf dem Prüfstand. GMD-Spiegel, issue 4, pp. 63–64. 1988. 6xq.net. Jochen Liedtke: Das MP-Betriebssystem EUMEL (Überblick). GMD-Studien, Software-Erstellung für Mikroprozessoren, volume 52, pp. 171–184. 1980. 6xq.net. Peter Heyderhoff: Entwurf der Benutzerschnittstelle des EUMEL-Editors. GMD-Studien, Software-Erstellung für Mikroprozessoren, volume 52, pp. 185–191. 1980. 6xq.net. Dietmar Heinrichs and Jochen Liedtke: Das MP-Betriebssystem EUMEL (Systemprogrammierung). GMD-Studien, Software-Erstellung für Mikroprozessoren, volume 52, pp. 193–201. 1980. 6xq.net. Jan Goossenaerts and Dirk Janssens: Object-Oriented Programming in EUMEL/ELAN. EUMEL-aktuell, issue 1/88, pp. 45–66. 1988. Klaus Görgen: EUMEL-X.25: Realisierung der CCITT-Schnittstelle X.25 (Schicht 3) auf einem EUMEL-System. Arbeitspapiere der GMD, issue 107. 1984-09. 6xq.net. Rainer Hahn: Die Ausbildung an einem Hochschulrechenzentrum. Das Rechenzentrum, pp. 204–208. 1978. 6xq.net. H. Peter Stock and Rainer Hahn: ELAN-Handbuch. 1979. archive.org. Peter Heyderhoff, Dietmar Heinrichs and Rainer Hahn: EUMEL-Benutzerhandbuch, Version 1.7. 1984. 6xq.net. Peter Heyderhoff, Rainer Hahn and Dietmar Heinrichs: EUMEL-Benutzerhandbuch, Version 1.7. 1986. Lothar Oppor: Hamster-Modell. Anwendersoftwareklasse 2. 1984. bitsavers.informatik.uni-stuttgart.de. Computer-Notizen: Ausbildungsauftrag. Handelsblatt, issue 40, p. 24. 1991-02-26. 6xq.net. Technologie-Transfer-Preis 1985 für „Eumel“. Happy Computer, p. 20. 1986-03. archive.org. Peter Heyderhoff: Programmieren mit ELAN. GMD-Spiegel, issue 3, pp. 4–14. 1976. 6xq.net. Peter Heyderhoff: My Lecture Notes. 1982. 6xq.net. Peter Heyderhoff and Konrad Klöckner: Der EUMEL-Ansatz zur Softwaretechnologie: eine Stellungnahme der GMD zum SIGMA—Projekt. 1985-03-25. 6xq.net. Peter Heyderhoff: Reisebericht Japan. 1985. 6xq.net. Dietmar Heinrichs: HG-Struktur 1.7.4. 1984-11-22. 6xq.net. Stefan Höltgen: Mit ELAN die Hardware vergessen (machen). 2012-01-05. simulationsraum.de. Cornelis Hermanns Antonius Koster, Joachim Jäckel, Karl Kleine, Stefan Jähnichen, Wilfried Koch and Günter Hommel: ELAN-Sprachbeschreibung. 1979. 6xq.net. Heiko Indenbirken: Compilerhandbuch BASIC. Anwendersoftwareklasse 2. 1984-07. bitsavers.informatik.uni-stuttgart.de. Peter Heyderhoff, Dietmar Heinrichs, Rainer Hahn and Jochen Liedtke: EUMEL Installation auf MCZ-Systemen, Version 1.5. 6xq.net. 1. Internes EUMEL-Seminar. 1984-03-13. 6xq.net. EUMEL: Softwareentwicklung auf Personal Computern. Informationstechnik it, volume 28, issue 3, p. 186. 1986. degruyter.com. Anwalts- und Notarprogramme auf der CEBIT 1986. IuR, issue 4, pp. 175–178. 1986. jurpc.de. Ralph Gureck and Dirk Refflinghaus: Die Automation in der Anwaltskanzlei. JurPC, issue 9, pp. 2784–2787. 1994. jurpc.de. Dietmar Heinrichs, Uwe Beyer, Konrad Klöckner, Eberhard Wegner, Jochen Liedtke and Gyula Szalay: EUMEL-Systemkern – Entwurf zur Systemdokumentation. 1983. 6xq.net. Jochen Liedtke and Dietmar Heinrichs: Quellcode Urlader 1.7.5. 6xq.net. Leo H. Klingen: ELAN. LOG IN, issue 3, pp. 34–37. 1983. 6xq.net. Leo H. Klingen and Jochen Liedtke: ELAN in 100 Beispielen. 1985. Konrad Klöckner: EUMEL im Härtetest – GMD-Präsentation eines μP-Multi-User-Betriebssystems. GMD-Spiegel, issue 2, pp. 81–83. 1979. 6xq.net. Konrad Klöckner and Jochen Liedtke: Using EUMEL in an Educational Environment. Advances In Microprocessing and Microprogramming, pp. 219–226. 1984. 6xq.net. Stefan Jähnichen and Wilfried Koch: ELAN – Eine Programmiersprache für die Ausbildung. GMD-Studien, Software-Erstellung für Mikroprozessoren, volume 52, pp. 97–112. 1980. 6xq.net. Rainer Hahn: Korrekturen und Nachträge I zum EUMEL-Benutzerhandbuch 1.7. 1984-05-09. bitsavers.informatik.uni-stuttgart.de. Cornelis Hermanns Antonius Koster: Top-Down Programming with ELAN. 1987. cs.ru.nl. L3 FREI Installation. 1994. 6xq.net. Werner Metterhausen: ERGOS-L3 Referenzhandbuch. 1990-03. 6xq.net. Werner Metterhausen: ERGOS-L3 Benutzerhandbuch (Auszug). 1990-10. 6xq.net. Jochen Liedtke: Implementation eines SLAN-Compilers, Teil 1. 1976. 6xq.net. Jochen Liedtke: EUMEL – ein neues Mikroprozessor-Betriebssystem wird vorgestellt. GMD-Spiegel, issue 2, pp. 18–31. 1979. 6xq.net. Jochen Liedtke: A Persistent System in Real Use – Experiences of the First 13 Years. International Workshop on Object-Orientation in Operating Systems. 1993. bitsavers.informatik.uni-stuttgart.de, os.inf.tu-dresden.de. John MacCarthy: LISP-Handbuch. Anwendersoftwareklasse 2. 1986-08-08. bitsavers.informatik.uni-stuttgart.de. Quellcode load ds4. 1989-02-10. 6xq.net. Klaus Bovermann: Das Betriebssystem Eumel-Elan. mc, issue 9, pp. 67–69. 1987-09. 6xq.net. Peter Heyderhoff: Modellcomputer MOCO. Anwendersoftwareklasse 2. 1984. bitsavers.informatik.uni-stuttgart.de. Frank Klapper: MS-DOS-DAT. Anwendersoftwareklasse 2. 1986-08-08. bitsavers.informatik.uni-stuttgart.de. Frank Klapper: MS-DOS-DAT: Lesen und Schreiben von MS-DOS Dateien. Anwendersoftwareklasse 2. 1987-09-10. 6xq.net. Dietmar Heinrichs: Netz-Beschreibung. 1985-03-13. 6xq.net. Dietmar Heinrichs: Netz-Beschreibung. 1985-09-02. 6xq.net. Dietmar Heinrichs: Netz-Beschreibung. 1988-08-08. bitsavers.informatik.uni-stuttgart.de. Albert Noltemeier: Goals and principles of the EUMEL operating system. German-Chinese Electronics Week, Proceedings of Congress, Part 4: Data Processing, pp. 43–55. 1987. Lothar Oppor: Spielend programmieren lernen mit dem Hamstermodell für ELAN. LOG IN, issue 5, pp. 32–35. 1985. 6xq.net. Jochen Liedtke: EUMEL Portierungshandhuch 8086/8088. 1985-10-22. 6xq.net. Jochen Liedtke: EUMEL Portierungshandhuch 8086/8088 Version 8. 1986-02. 6xq.net. Jochen Liedtke and Dietmar Heinrichs: EUMEL Portierungshandhuch Z80. 1984-08-28. 6xq.net. Wolfgang Ambros, Michael Diehl and Gerd Aschemann: Für Einsteiger. EUMEL-Praxis, volume 1. 1989. 6xq.net. Wolfgang Ambros, Gerd Aschemann and Michael Diehl: Für Programmierer. EUMEL-Praxis, volume 2. 1990. 6xq.net. Gerd Aschemann, Wolfgang Ambros and Michael Diehl: Für Anwender. EUMEL-Praxis, volume 3. 1991. 6xq.net. Irmgard Ley and Werner Metterhausen: Benutzerhandbuch: Programmierung. 1987-07-01. bitsavers.informatik.uni-stuttgart.de. EUMEL – ein Mikroprozessor Betriebssystem der GMD. Elektronische Rechenanlagen, volume 21, issue 5, p. 252. 1979. degruyter.com. EUMEL - ein Schulrechnerbetriebssystem auf der Basis der Programmiersprache ELAN. Elektronische Rechenanlagen, issue 4. 1983. 6xq.net. S. Rehder: A Shell for Microcomputer Exploration Software Used in Developing Countries. Quantitative Analysis of Mineral and Energy Resources, pp. 625–631. 1988. Udo Schneider: REMIS: Programmier-Handbuch. 1984-10. bitsavers.informatik.uni-stuttgart.de. Udo Schneider: REMIS: Programmier-Handbuch. 1986-08-08. bitsavers.informatik.uni-stuttgart.de. Bernd Reuse and Roland Vollmar: Informatikforschung in Deutschland. 2008. 6xq.net. EUMEL auf Apple II/II+ und Kompatiblen (BASIS 108). 6xq.net. Harald Schütz: Text- und Datenverarbeitung in der Anwaltskanzlei. IuR, issue 2, pp. 92–96. 1986. jurpc.de. Annemarie Abshoff: schulis-Mathematiksystem: Didaktisches Begleitheft. 1990. 6xq.net. Reiner Kraft, Annemarie Abshoff and Georg Jünger: schulis-Mathematiksystem: Handbuch. 1990. 6xq.net. Wolfgang Seyfert: Laßt den EUMEL in die Schulen!. LOG IN, issue 7, pp. 30–33. 1987. 6xq.net. Betriebssystem EUMEL. Der EUMEL-SHard. Version 5.0. 1986. Dietmar Heinrichs: Shard Interface Beschreibung. 1979-05-25. 6xq.net. Quellcode SHardmodule Schönbeck. 1989. 6xq.net. Quellcode SHard Interface Module 8086. 1986-05-20. 6xq.net. Peter Gaschick and Brigitte Schmidt: SIMSEL: Modellheft Biologie 1, Populationsökologie. schulis-Simulationssystem. 6xq.net. Brigitte Schmidt: SIMSEL: Modellheft Biologie 2, Enzymkinetik. schulis-Simulationssystem. 6xq.net. Brigitte Schmidt and Wolfgang Asselborn: SIMSEL: Modellheft Chemie 1, Reaktionskinetik I. schulis-Simulationssystem. 6xq.net. Wolfgang Asselborn and Brigitte Schmidt: SIMSEL: Modellheft Chemie 2, Reaktionskinetik II. schulis-Simulationssystem. 6xq.net. Brigitte Schmidt and Jürgen Becker: SIMSEL: Modellheft Chemie/Physik, Radioaktiver Zerfall. schulis-Simulationssystem. 6xq.net. Brigitte Schmidt: SIMSEL. schulis-Simulationssystem. 6xq.net. Brigitte Schmidt and Jürgen Becker: SIMSEL: Modellheft Physik 1, Bewegungen im Gravitationsfeld. schulis-Simulationssystem. 6xq.net. Brigitte Schmidt and H.-J. Korsch: SIMSEL: Modellheft Physik 2, Mechanische Schwingungen. schulis-Simulationssystem. 6xq.net. Jürgen Becker and Brigitte Schmidt: SIMSEL: Modellheft Physik 3, Ladungen in elektrischen und magnetischen Feldern. schulis-Simulationssystem. 6xq.net. H.-J. Korsch and Brigitte Schmidt: SIMSEL: Modellheft Physik 4, RLC-Schaltungen. schulis-Simulationssystem. 6xq.net. Brigitte Schmidt and H.-J. Korsch: SIMSEL: Modellheft Physik 5, Relativistische Bewegungen. schulis-Simulationssystem. 6xq.net. Bhabani P. Sinha, Peter Heyderhoff and G. Hoens: Implementation of X25 on the microcomputer system EUMEL for connection to public communication network. Golden Jubilee Conference on Advances in Information Science and Technology, ISI, Calcutta. 1982. Software-Führer ’93/’94 Lehre und Forschung: Ingenieurwissenschaften. 1993. 6xq.net. Ernst Schrenk: Quellcode der insertierten ELAN-Pakete, Version 1.6.5. 1982-10-01. 6xq.net. EUMEL-Quellcode der insertierten ELAN-Pakete. 1984-05-16. EUMEL-Quellcode der insertierten ELAN-Pakete. 1984-10-01. 6xq.net. Quellcode der insertierten ELAN-Pakete, Multi-User. 1986-11-10. 6xq.net. Quellcode der insertierten ELAN-Pakete, Single-User. 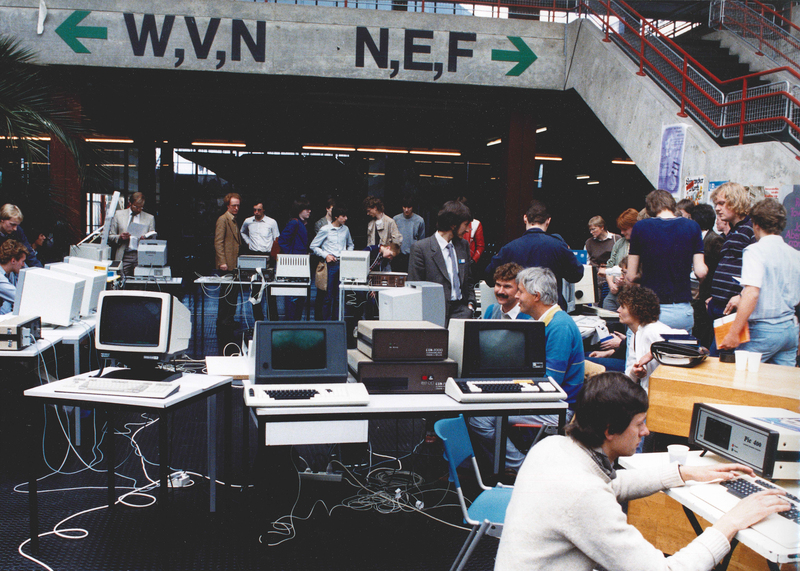 1986-11-10. bitsavers.informatik.uni-stuttgart.de. EUMEL: Ein neues Betriebssystem für den Atari ST (Teil 1). ST-Computer. 1987. stcarchiv.de. EUMEL - Ein neues Betriebssystem für den Atari ST (Teil 3). ST-Computer. 1987. stcarchiv.de. Dietmar Heinrichs, Jochen Liedtke and Rainer Hahn: Systemhandbuch. 1984-05-16. bitsavers.informatik.uni-stuttgart.de. Rainer Hahn, Jochen Liedtke and Dietmar Heinrichs: EUMEL-Systemhandbuch, Version 1.7, Stand 13.3.85. 1985. Rainer Hahn, Jochen Liedtke and Dietmar Heinrichs: Systemhandbuch. 1986-08-08. bitsavers.informatik.uni-stuttgart.de. Werner Metterhausen, Monika Fey-McClean and Konrad Klöckner: Benutzerhandbuch: Textverarbeitung. 1986-12-19. bitsavers.informatik.uni-stuttgart.de. E. Kammerer and Albert Noltemeier: Das Mehrplatz-Betriebssystem EUMEL für Mikrorechner. 1985-04. 6xq.net. Preisblatt für die Software-Lizenz des Betriebssystems EUMEL. EUMEL: Das Betriebssystem für Mikrocomputer. Produktinformation. Für Anwender und Hersteller. 1985-11-08. 6xq.net. Derzeitige Vertriebspartner für das Betriebssystem EUMEL. 1986-10. 6xq.net. Ursula Viebeg: EUMEL.X29: Realisierung eines Software-PAD auf einem EUMEL-System. Arbeitspapiere der GMD, issue 114. 1984-11. 6xq.net. Clemens Wermelskirchen: Anschluss eines EUMEL an die IBM 3083. Arbeitspapiere der GMD, issue 65. 1983-11. 6xq.net. Werner Metterhausen, Monika Fey-McClean and Konrad Klöckner: User Manual: Part 1: Word Processing. 1987-06-01. bitsavers.informatik.uni-stuttgart.de. Elmar Zielke: Restauration eines Olivetti M20. 2014-11-03. medienfragen.de. Uwe Beyer: EUMEL – Ein zukunftsweisendes Betriebssystem. 6xq.net.